Drydocks World Group met with experts from the global offshore energy industry that came together from around the world for the Offshore Technology Conference (OTC) from May 4th-7th in Houston, Texas. Drydocks World Group’s senior management met with existing and prospective clients to update on the yards developments, inform on recent achievements and market the yards ability to deliver complex offshore projects. Drydocks World Group is enhancing the global comprehensive services of the Dubai yard catering to the international energy industry. The in-house facilities and skilled team at Drydocks World Group have the ability to accommodate and construct all types of offshore projects. 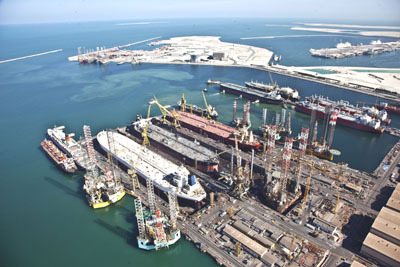 The graving docks, floating docks, hydro lift capable of building offshore structures and FPSO hulls, extensive berth space, 2000 tonne floating crane, engineering support, exotic pipe fabrication shop and specialized workforce at Drydocks World Group have the proven capabilities to construct world first mega projects. The specialist services of Global Offshore Services, the Marine Services Department, the Yacht Repair Division and the Rig division give added technical expertise to the yard to deliver projects on-time and with the highest international standards of excellence. Drydocks World Group has repaired more than 140 rigs/Jack-ups, maximizing their operational efficiency to enhance production operations.